Welcome to the first ever Babbling Books Read-along! This October we will be reading Neverwhere by Neil Gaiman together. Neverwhere is one of those books that has always held a special place in my heart, but I realised recently that the details had faded into a pleasant nostalgic blur -it has been 10 years since I read it afterall. Thus a read-along seemed the perfect way to refresh my memory & share the story with friends! Below you will find a calendar with will the important dates to remember. There are 20 chapters in the novel, so we will be reading 5 chapters a week. If you fall behind, or skip ahead that’s fine, just be aware that the discussions at the end of each week will cover everything that has happened so far (and if you’ve fallen behind may contain spoliers). Each Friday I will write a blog post with some discussion questions and my thoughts so far, and you can add you own comments below each one. Discussion on Instagram can be a little ‘messy’ and not everyone is on Goodreads so this platform should suit. All you need is an email address to leave a comment. To make the month extra exciting each week I have a photo challenge for you. Completing it is optional, but I will feature my favourite photo/s in the weekly discussion posts, so it’s a great opportunity to show off your photography skills – and I’ve seen all your accounts so I know you have great talent! Don’t forget to use the tag #BabblingBooksRA on Instagram/Tumblr/Twitter and mention me in the comments so I can see your photos & comments. Have you read Neverwhere before? In the introduction Neil mentions Neverwhere was inspired by his favourite childhood stories: Alice in Wonderland, The Chronicles of Narnia, & The Wizard of Oz. What were your favourite childhood books? 31st – End of read-along – Halloween! If your username isn’t on this list or I’ve spelled it incorrectly, please let me know and I will update it! Hi everyone, I’m Tamsien, the host! I’m from Australia, and I’ve read Neverwhere once before, about 10 years ago. My favourite stories from my childhood were, The Secret Garden, A Little Princess, A Thousand & One Arabian Nights, various versions of the legends of King Arthur. I’m so excited to share this read-along with you all! Hi guys, I’m so excited!!! This is the first time of reading “never where” and super excited to be sharing the experience! I read everything I could lay my hands on as a kid – but loved horror/suspense like R L stein and Stephen King. Fellow Australian! Hello! I was too much of a wimp for scary stories, the Famous Five or Secret Seven detective stories were about as far as I could go into thriller territory! Haha I was reading RL stien and Stephen King in third grade and my teacher thought it “inappropriate” reading material. I’m probably going to be burned at the stake for saying this / but I found Enid Blyton boring. I read so many of her books (they were always given to me as gifts) but ‘goosebumps’ was my book of choice as a small kid – evolving into Tolkien and fantasy Cecilia dart-Thornton and the like. Hahaha, no burning at the stake here! The thing I love about reading is that everyone likes different things, and actually everyone reads a different book, because they take from it different things. For me Goosebumps was too scary, I loved the whimsical ‘adventure’ stories of Enid Blyton, and loved that they were formulaic (though I wouldn’t have known that word) because I always felt confident everything would be ok 😉 But I totally get the ‘reading things not appropriate for your age’ thing. I read the LotR trilogy when I was 10, and now when I look at my 10 year old cousin I think, I’m not sure I would suggest you read that!! I also read LoTR really young; I took such pride hauling these heavy books to primary school. I started them when I was 8 – but it took me so long to read that, when I finished, I couldn’t remember how it started! And I was addicted to all things Enid Blyton. She was actually the reason I ended up going to boarding school. True story. But I recently acquired some from the op-shop for $8!!! Winning!!! Haha put them away for my kidlets. I don’t agree with “inappropriate” books – teachers restricted me to School appropriate style books and it killed my my appetite for reading. Hi! I’m Steph, also known as @bookishsteph1 on Instagram. I’m from Wales, UK. I’ve Neverread (😁) Neverwhere before but I’m really excited to read it with you all. This will be my first read-along too! My favourite childhood books were/are The Hobbit, Alice’s Adventures in Wonderland (fist pump to Gaiman), The Silver Sword by Ian Serraillier, Adventures of Pip by Enid Blyton and Dirty Beasts by Roald Dahl. Bye for now! I can’t believe I didn’t mention Enid Blyton! The Magic Faraway tree was a favourite along with the Famous Five and Secret Seven! I forgot Enid Blyton too! My Pa used to give me and my sisters his spare change and I’d save up to buy her hardbacks from the op shop! The Magical Faraway Tree and The Wishing Chair were my favourites! Oh yes! Those two were my favourites as well. I’m loving all the nostalgia-tinted memories that this discussion is bringing up! A Neil Gaiman newbie! Well I do hope you love this book, it was the first of his I read and started the love affair I have with his stories!! I’m Caitlin, from Melbourne, Australia! I first read Neverwhere about 4 years ago and it ignited a furious love for Gaiman so I can’t wait to reread it! My favourite children’s book were anything by Roald Dahl but The Witches was my favourite, The Princess and The Goblins, Peter Pan (which I had on cassette and fell asleep to every night), Grimm & Hans Christian Anderson fairy tales, and of course Alice in Wonderland and Through The Looking Glass. Anything a little bit creepy, otherworldly, or magical was my jam! A fellow Melbournian! (How beautiful was the weather this weekend?!) I ADORED Roald Dahl, Henry Sugar and other tales is one of my most battered books from being reread so many times! Hope you enjoy the reread, I know my memory is SUPER fuzzy! The weather has been beautiful, I spent every second I wasn’t at work reading out in the garden! Hopefully it holds up so we can do a bit of Neverwhere reading in the sunshine! I read this book about10 years ago , and have developed a love of all things “Gaiman” I love all his writing fron short stories to children’s books, adult fiction and his cornerstone graphic novels series Sandman. I can’t wait to reread this book ! I forgot to mention my favourite childhood books Enid Blyton book and Grimms fairy tales were my go to fiction reads. However I used to spend Saturday’s with my head in my Fathers National Geographics, I loved them ! Neverwhere was my first Gaiman too! It definitely kickstarted my love for his writing, and I quickly worked my way through Good Omens, Anansi Boys, American Gods and some of his comic book writing. He never fails to delight me! Hope you enjoy this reread, I can’t wait to get started! I am Sandra or @thedarkestpartsofsnow on Instagram 😀 and live in Germany. I have only read one novel by Neil Gaiman so far which was The Ocean at the End of the Lane but I really wanted to read far more. So your read-along, Tamsien, came at a perfect time! I am really excited to read with all you guys! I just read The Ocean at the End of the Lane and loved it… What did you think? Oh – and Anne of Green Gables was one of my ultimate growing up books! Hello! I’m Alisha (@alishas_guide on Instagram) and I live in Wales, UK. I haven’t read Neverwhere before but have been meaning to for a while. My favourite childhood books were The Hobbit, anything Enid Blyton, Alice in wonderland and Grimms Fairy tales. Another reader from Wales! How wonderful! Excellent childhood stories, I sometimes found the Grimms Fairy Tales a bit scary (and I never was good with scary things), even now I don’t read horror or thrillers very often! Welcome to the readalong! Hello! I’m from North Carolina. This will be my first time reading Neverwhere-can’t wait! This first book I fell in love with was Charlotte’s Web. I read all the Babysitter’s Club books until about middle school where I discovered Stephen King. Looking forward to the read along! Welcome! And woah Babysitters Club to Stephen King that’s an interesting leap!! I adored the Baby Sitters Club books, lots of my childhood memories are of borrowing those and the Saddle Club books from the local library and hoping they weren’t ones I had read before (because of course I could never remember the titles). Hi, I’m Dena (Bookworm_365 on Instagram). I have read Neil Gaiman before but not Neverwhere so this is my first read of this book. Very excited! I live in the US, so I think I’m about a half a day or more behind a lot of you!! I am just now starting my Sunday morning. I loved reading as a child in particular Alice in Wonderland, The Secret Garden, James and the Giant Peach by Roald Dahl, and of course Narnia. Looking forward to this read-along and am writing the dates in my calendar now!! Thank so much Tamsien for hosting this!! Welcome Dena! Don’t worry too much about the time difference, we have readers from all across the world. I will post the discussions on Friday evening Australian time, but feel free to comment whenever works for you. Being a little later you will be able to read lots of comments and give interesting replies 🙂 I imagine the discussions will go over a couple of days, as people check in at different times. Yay! Looking forward to reading this along with you! American Gods & Neverwhere in one month, great plan! I’ll admit American Gods is not my favourite of Gaiman’s but when I re-read my review of it recently I think I might have judged it too harshly. My review sounds like an academic essay (and I was a university student at the time), and I don’t think I was able to just sink in and enjoy it. I recently read Trigger Warning, Gaiman’s newsest short story collection, and it has a follow up short story to American Gods with Shadow as the main character, and I loved it. So perhaps I need to revisit American Gods at some stage. Let me know how it goes!! I’m Nathalie and I live in Germany 🙂 I haven’t read any of Gaiman’s books so far, so I’m really excited to read Neverwhere. As a child I loved Astrid Lindgren’s stories and the Harry Potter books. Hi Nathalie! Wonderful to have you joining us. I think Neverwhere is the perfect introduction to Neil Gaiman’s writing. I hope you like it, but even if you don’t we will surely have an interesting discussion! I’m Corrinna and I’m currently residing in Geelong, Australia. Gaiman is one of those writers that I’ve always heard great praise about but never actually read (aside from a collaboration with Terry Pratchett, which, I’m sad to report, I didn’t get far into before giving up), so this will be a new experience. I must admit I was already in the process of reading this before the challenge was announced but I will say that what I have read so far I really loved 🙂 I can’t remember any book specifically that I loved before the age of ten or so, but I do remember loving Charles Dickens’ “David Copperfield”, a collection of Grimm’s fairy tales and the Harry Potter books. Ironically I was much more of a tv/film girl growing up, so can name dozens of favourite childhood films growing up but not books; a bit of the opposite now! Hullo Corrinna! As my esteemed co-host I am so very very excited to be reading this along with you in October. Seriously I did a little happy dance when I made this first post, and I can’t wait to kick it all off on Thursday!! Hi! I’m Cat, I love in London and have never read anything by Neil Gaiman so I’m excited to start with Neverwhere (and I’ve heard it’s a great place to start!) My favourite books to read when I was younger were mostly The Naughtiest Girl series by Enid Blyton 🙂 Can’t wait to get started! Hi Cat! 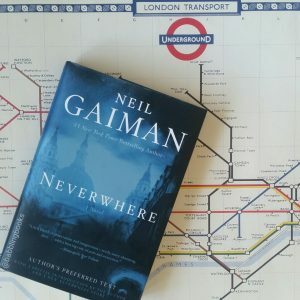 Neverwhere is set in London, so I’m hoping to see some ‘Neverwhere in it’s natural habitat’ photos from you if you have a chance! I really hope you enjoy it, I think that Neverwhere is a perfect introduction to Gaiman’s writing style. Happy reading! Hi everyone! My name is Holly (@holly_reads on instagram), and I live in Green Bay, Wisconsin. This will be my first read-along, and I’m really hoping I can keep up! (With two kids under the age of three my reading time has become grabbing minutes of reading between working, naps and meals!) I have read a couple books by Neil Gaiman before, but Neverwhere has been on my TBR list for a long time, so I can’t wait to finally pick it up! My very first “favorite” book was probably Charlotte’s Web. I remember my dad reading it to me when I was very young, and then reading it over and over on my own. I also grew up reading the Babysitter’s Club, Goosebumps, and American Girl books. Excited to read with you all!! Like a lot of you, I read Neverwhere years ago. I remember loving it but I could definitely do with a story refresh. My favourite books growing up were… the Faraway Tree, the Twins at St Claire’s (and anything else by Enid Blyton), What Katy Did, Anne of Green Gables, the Nancy Drew mysteries and the Babysitters Club!! Welcome Lara! It really is so wonderful to see how many common books there are across the group, even though we are all from different parts of the world. So I just know we will all get along wonderfully! Hello everyone! I’m Tangalene (@tanged on Instagram) and I live in Arizona. I have read Coraline, the Graveyard Book, Stardust, the Ocean at the End of the Lane, and a couple of volumes of Sandman, but haven’t read Neverwhere before and I believe this is a great opportunity to do so! Some of my childhood favorites books/authors were Shel Silverstein, Roald Dahl, Little House on the Prairie, Anne of Green Gables, and Encyclopedia Brown. Wonderful to have you along for the read! Hope you enjoy this one, it is Gaiman’s first published novel, so having read his later works it will be interesting to see what you think of this one. I think it has a lot of the characteristics that define his fascinating style. Hi guys. I’m Lauren (@classicbibliophile) and I live in Devon, UK. I listened to the BBC Radio 4 play of Neverwhere in 2013, with James McAvoy, Benedict Cumberbatch, Natalie Dormer etc, and I loved it, book has been in my to be read pile ever since, so this read along is the push I’ve needed to finally read it. Can’t wait to start properly tonight. My favourite childhood books were The Chronicles of Narnia, The Moomins, Little Women, What Katy Did series, Alice in Wonderland, Asterix, Roald Dahl and mostly anything/everything by Enid Blyton. Goodness me we all have such similar childhood favourites, I wonder if that is what leads us to having similar taste later in life and enjoying Neil Gaiman’s work together. His book certainly have elements of mystery, magic and are just a little bit dark! Happy reading! Hi everyone, little late to the party, but my name is Afshaan (@hitchhikeress; I actually have a separate bookstagram account now – @accidentalbooknerd – so I’ll probably follow some of you guys from that account) and I’m from Mumbai, India. I have not read Neverwhere before but have experienced Gaiman’s writing in American Gods (which I have sort of left incomplete; but I’ll fix that soon). My copy of Neverwhere is in the mail so I should be getting it in a few days. Looking forward to reading this. I hope you enjoy Neverwhere when it arrives. The chapters are really short (the prologue was only 4 pages) so you should be able to catch up easily! Oh, I grew up reading classic fairy tales, Red Riding Hood, Rapunzel, Snow White and the Seven Dwarves and the lot. I also had this big fat book of Panchatantra tales (https://en.wikipedia.org/wiki/Panchatantra) for kids, all of which had some moral lessons. My first “real” foray into reading started with the The Three Investigators series when I was in school. We used to have a library period wherein a bunch of books were brought to the class and you could take one and read for the entire period! Now that I think about it, this probably kindled the reader in me. HI I’m Gabby and you can find me on instagram at @chicachiflada. My most favourite childhood book is The Secret Garden. It’s the first time I read Neverwhere and I am loving it! I’ve read Neil Gaiman before, and his style is always so brilliantly soothing in a way. Thanks for joining in Gabby! I’m so glad to hear that you are enjoying it so far! Thank you so much for welcoming me into your read-along! I’m going to get started later today so I can read the discussion of the prologue and be ready for tomorrow. Hi everyone!! I’m Danielle. I’m a New York native currently living in the midwest. I haven’t read Neverwhere, so I am extra eager to jump in. I love Neil Gaiman and get completely immersed in his worlds. As a kid, I devoured R.L. Stine and Christopher Pike novels. I’ve read the Narnia series more times than I can count, and it had a huge impact on me as a kid. Alice in Wonderland remains one of my all-time favorite stories; I can never have enough of her. I’m going to start Neverwhere so I can catch up on the Prologue discussion and then read for tomorrow. I’m happy to have joined you! Thanks for letting me know the link, I have added you to the list! Keep an eye out on my instagram for updates, I don’t want to spam people with tags etc. Thanks for adding me to the list! I am definitely keeping up on instagram and love the feed about this. Sorry I’m late, I was travelling and then there was a week-long film festival I was working/attending, so I was swamped. Narnia! I read it as a child and loved it!